Magna Carta Vape is established as a contender for one of the best cartridges on the market for flavor and potency after winning 1st place at the 2017 Hempcon. This ultra-refined oil was produced using a distillation process with natural added terpenes. The dual coil wick-less cartridge provides a large draw to create a high quality experience while remaining discrete. 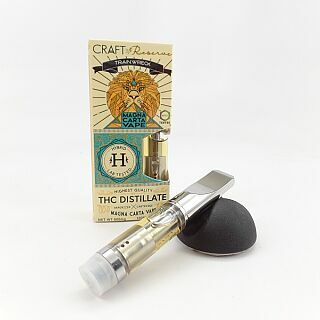 These cartridges are 600mg of distillate oil so they are a great value when compared to the standard 500mg cartridge. These cartridges fit all 510 threaded pens, and work with or without button activation.